Horace Pippin lived in West Chester, Pennsylvania, a suburb of Philadelphia not far from Lancaster County. The artist drew his subject matter primarily from the activities of small- town life. He had little use for those who suggested he seek formal artistic training. Instead, he preferred to embrace his own method, painting each work on the basis of images visualized in his head with no preparatory drawings or sketches. Pippin suffered an injury in World War I that limited the mobility of his right arm, so he used small canvases, which offer an intimate glimpse into the world of his imagination. He built his scenes with areas of color using very little perspective, resulting in a graphic quality that set his work apart from that of his contemporaries. 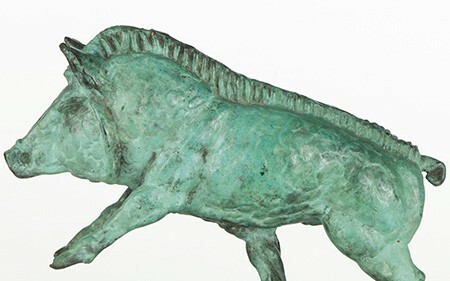 By 1938, Pippin’s work was included in an exhibition at the Museum of Modern Art in New York entitled Masters of Popular Painting: Exhibition of Modern Primitives of Europe and America, April 27–June 27. His work was shown alongside artists such as Henri Rousseau and Edward Hicks, among others. Robert Carlen, an art dealer in Philadelphia, took a great interest in Pippin’s work and mounted his first solo exhibition in January 1940. The visionary collector Albert Barnes saw Pippin’s paintings as they were being installed at Carlen’s gallery and bought several on the spot. Pippin painted at least two dozen floral still lifes in the 1940s, including those featured in several unpeopled domestic interiors. A range of inspirational factors are credited to Pippin: his exposure to French Impressionist still lifes in the Barnes collection in 1939, his dealer’s interest in marketable subjects, or a natural evolution from war-oriented subjects to those indicative of a greater peace of mind. However, there was also a long still-life tradition in Philadelphia and the Brandywine River Valley, and quite simply Pippin also loved gardening. 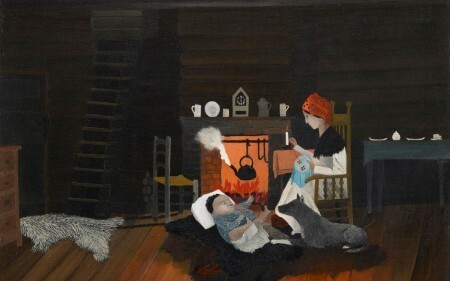 “Neighbors readily recall the animation with which the Pippins discussed selections and designs for their two gardens, one grown in their backyard essentially for pleasure from spring to late fall since the 1920s and another to which they drove” (Judith Stein, I Tell My Heart: The Art of Horace Pippin, Philadelphia, 1993, pp. 106, 115). Pippin painted doilies in nearly all of his still lifes, draped over the arms and backs of chairs and underneath vases. The size of the flower arrangements he chose to paint varied from quite grand to small-scale, and Pippin depicted a variety of vase forms. The flowers in the present work appear to be yellow hibiscus, daisies and red asters. The yellow polka-dots and diamond pattern on the vase in Flowers with Four Doilies give the painting a wonderful texture. Despite their relatively sanguine subject matter, scholar Lynda Roscoe Hartigan makes a case for the value of Pippin’s still lifes among his entire artistic output. 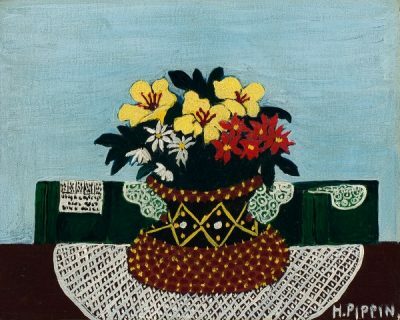 She states: “Horace Pippin insisted that he ‘have all the details that are necessary’ to ‘paint it exactly the way it is and exactly the way I see it.’ Similarly, we need to retrieve these details to locate the reality of Pippin’s works, from landscapes to still lifes, from portraits to life’s interiors. 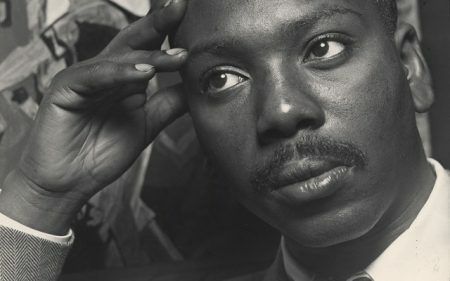 Equally crucial is valuing these diverse subjects for their autobiographical, regional, and cultural under- pinnings—underpinnings that link them irrevocably to Pippin’s more celebrated paintings of war, spiritual harmony and African-American life” (ibid., p. 121).